At fourteen, Nick Gautier thinks he knows everything about the world around him. Streetwise, tough and savvy, his quick sarcasm is the stuff of legends.. until the night when his best friends try to kill him. Saved by a mysterious warrior who has more fighting skills than Chuck Norris, Nick is sucked into the realm of the Dark-Hunters: immortal vampire slayers who risk everything to save humanity. Nick quickly learns that the human world is only a veil for a much larger and more dangerous one: a world where the captain of the football team is a werewolf and the girl he has a crush on goes out at night to stake the undead. But before he can even learn the rules of this new world, his fellow students are turning into flesh eating zombies. And he's next on the menu. This is one of the books that I've owned since forever and somehow never picked up. If Amber hadn't picked my book without knowing, I'm sure it would still be on my shelf, unread and neglected. But thankfully it's not anymore! 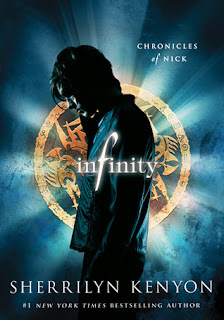 Infinity is fast paced, with loads of twists and turns along the way, plus a snarky main character who adds humor to the mix. Me like! Apparently, this book ties in with Kenyon's other series in terms of that it takes place in the same world and shows some of the characters from the other series. I have not read those books (yet), so I don't know how true that is or how it works out, but I do know that I really liked the set-up of this world. It's believable and packed with action, which helped me get rid of my reading funk. I had been in one for about three weeks when I picked this one up, and where I was unable to finish any book, this book pulled me right out of my funk. There's not a dull moment in this book. I loved that the narrator is a guy - I don't read enough books with male protagonists - and I can't wait to catch up with Nick again. He's easy to follow around, although sometimes very naive, but that makes him believable as a character. He often adds his sarcastic commentary to the events and I loved that. If you're looking for a fast-paced story with a male narrator, plus a whole lot of paranormal elements, this is the book for you! I'd definitely recommend picking it up!